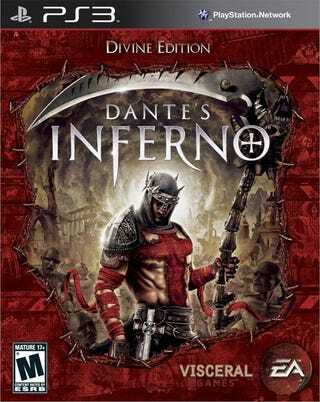 Early access to the demo was just the beginning, as Visceral Games announces the Dante's Inferno Divine Edition, a PlayStation 3 exclusive version of the game packed with extra content at no additional cost. The Dante's Inferno Divine Edition is the version all PlayStation 3 owners will be receiving once the game is released on February 9th, so there's no need to worry about changing over your preorders or making sure you don't get a gimped version accidentally. Whether they want it or not, they're getting it. What are they getting? On top of the game itself, the Divine Edition comes with developer commentaries, a Wayne Barlow digital art book, the game's soundtrack, and a digital copy of the complete Longfellow translation of Dante Alighieri's Inferno. If you have told me three years ago that a PlayStation 3 game would be packed with the Longfellow translation of anything, I would have been impressed by your strange thought process and bought you an alcoholic beverage of your choosing. "We are thrilled to offer an exclusive game pack for PlayStation 3 gamers," said Jonathan Knight, Executive Producer for Dante's Inferno. "The PlayStation platform has a long history of delivering AAA action/adventure games. Adding Dante's Inferno to that rich catalogue is very exciting for the team. And with the demo now available on the PlayStation Network, players can finally get a taste of what awaits them in the full game on Feb 9th." The Divine Edition of Dante's Inferno certainly contains enough additional content to justify jacking the price up another $10, but EA is delivering this treat to PlayStation 3 owners for just $59.99, the same price Xbox 360 owners will pay for their plain vanilla version, barring any forthcoming announcements of special content for Microsoft console owners.